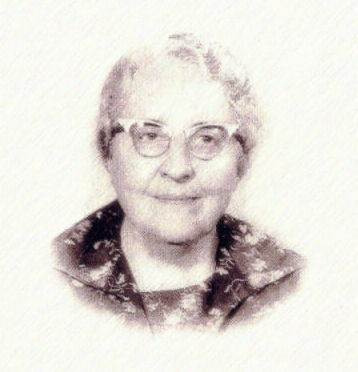 Anna Elizabeth Boss was born on November 27, 1902, in Malad, Idaho. She was born on Thanksgiving Day. Her parents, Adolph Boss and Sara Alleman Boss, were living in their own home for the first time. Her father had built it in one month during the summer. It was a small two-room square house built of logs, with a rock foundation. Her father had been born in Gundlischwand, Switzerland in 1876. Part of his family, including two sisters and his father, joined the Church of Jesus Christ of Latter-day Saints in the 1880s. In the spring of 1891, at the age of 14, Adolph left his home in Switzerland for America. He was accompanied by his brother, Peter, then 11 years old, his father, John Boss, an architect and building contractor, and his stepmother, Margaret, whom his father, age 60, had recently married. Her mother, Sarah Alleman, had been born in Tschappina, Canton Grison, Switzerland, in 1877. Her family had joined the Church in 1879, and migrated to the Great Basin shortly after their conversion. They settled in Paris, Idaho, about ten miles south of Montpelier. Later they moved to the predominantly Swiss village of Bern. Adolph and Sarah married on December 20, 1901 in the Salt Lake Temple. They honeymooned in Midway, Utah. Adolph worked at a sawmill in Malad for several years. However, in the fall of 1904, her father caught a bad cold and got pneumonia, which turned into tuberculosis. They moved back to Bern, Idaho, where he died on June 13, 1906. Anna and her mother lived with family members until October of 1910, when they moved to Logan to be near the temple. 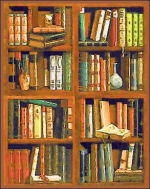 Sarah had received a large family genealogical record from Switzerland containing thousands of names. She felt that she needed to accomplish the temple work for these people, and had sufficient names to stay busy in the temple for years. Annie spent her summers with family in Bern and Crow Creek, Idaho. Her mother took in washing, ironing and sewing, and swept rooms and cleaned house for people. She also washed dishes and cleaned at the college, and helped clean the temple and the meeting house. Using money from the sale of their home in Malad, Anna's mother purchased a lot and hired a contractor to build a house for her, which was completed in 1912 and 1913. They rented two upstairs rooms for income. For many years Sarah's parents, Anna's grandparents, lived in their Logan home together. They took full advantage of the cultural activities of a college town, and attended many events together. 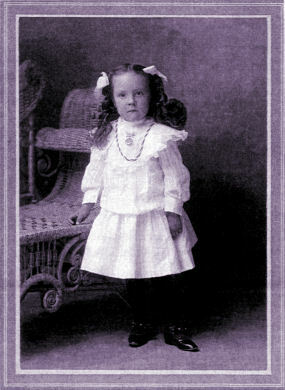 Anna attended grammar school in Logan, then enrolled in Brigham Young College, one of several high-school-level academies then operating in Utah, from September 1916 to May 1920. She taught school for one year after graduation, teaching a variety of subjects at a grammar school in nearby Millville. But she felt the need for more education. Anna went on to attend Utah State University, then known simply as the "A.C." for Agricultural College. She received her B.A. degree in May of 1923. Her life was filled with family, home, church, school and friends. She was a good student, but quite openly expressed her dismay and outright dislike for some aspects of school, certain subjects, and certain teachers. She directed plays and was well known for giving readings, and singing in choirs and quartets. She dated in groups and attended dances, and balanced this with much work around her home. Her family was careful and survived the influenza epidemic of 1918. 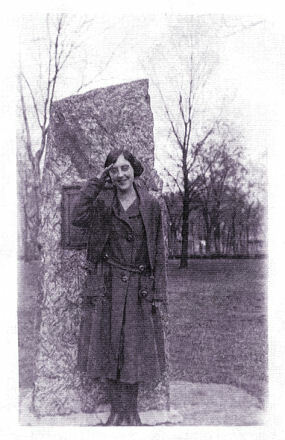 After graduation from college, Anna served a mission from July 1, 1925 to August 8, 1927, in the Central States Mission. She served in Texas, Missouri, and Kansas. While on her mission she served a time as a school principal and teacher in Kelsey, Texas. Upon her return she received a job teaching high school at Arimo, Idaho. From 1929 to 1935 she served as an instructor in English and head of the Dramatics and Speech Department at Logan High School. It was a perfect job, as far as she was concerned. It was close to home, doing work that she loved, close to childhood friends, church and temple. And there were so many cultural activities that enriched her life. She attended hundreds of concerts, and in her scrapbooks, kept virtually every ticket and program. Her exemplary work as a teacher led to her being asked to train student teachers -- later her life work at BYU. In the midst of the Great Depression, Anna was able to go to school at the University of Southern California - Berkeley, for five summers in a row. She took courses in speech, education, theater and psychology. She studied Greek literature, play production, advanced dramatics, reading of verse, and religious pageants and drama. She took a comprehensive examination and completed all of the requirements for the M.A. degree. And Anna had a lot of fun in California during those summers. Anna had received her master's degree from USC and was half-way through another year of teaching at Logan High when she met the man she was to marry. She had several other suitors at the same time. John William Hart was a silver-haired 68-year-old widower and stake president when he met 33-year-old Anna. He and his first wife, Elizabeth J. Hogge, had raised fourteen children. He was an Idaho farmer, and president or director of many agricultural organizations and companies. He was also a Justice of the Peace and member of the Idaho Legislature for 14 years -- one term in the House and six terms in the Senate. He was a Republican leader, and served as president pro-tem of the senate the last two years. He was a presidential elector in the electoral college. 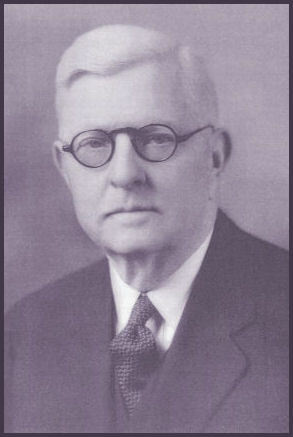 He helped create the southern branch of the University of Idaho in Pocatello, which later became Idaho State University. The list of his political achievements is long and impressive. John Hart gave Anna two diamond rings, and they were married on June 4, 1935. They were married in the Salt Lake Temple and stayed at the Hotel Utah. They honeymooned in the Utah parks and in California. They returned to live in Rigby, Idaho. Anna smoothly assumed the role of wife, hostess and companion for a well-known and important man, and to some extent, surrogate mother for John's children from his first marriage, all of whom were married by that time. During their first year of marriage, the Rigby First Ward celebrated its 50th anniversary, and Anna was asked to write an historical pageant. She did, and it had a cast of 75. They spent their first Christmas together in a joyful family celebration. In April they journeyed to Salt Lake City to attend General Conference of the Church. On April 5, 1936, after having attended several conference sessions and while staying at the Hotel Utah, John Hart fell in the bathroom and could not be revived. His death was reported nationally, and Anna was in a state of shock. After John Hart's funeral, Anna began trying to adjust to being a young widow. She moved back to Logan to be with her mother. And Anna was expecting a child. This raised her spirits and gave her a new life and new meaning to her own life. On Sunday afternoon, November 29, 1936, after 23 hours of labor, her son was born. He was born, however, on the edge of death, and revived only after extensive medical intervention. 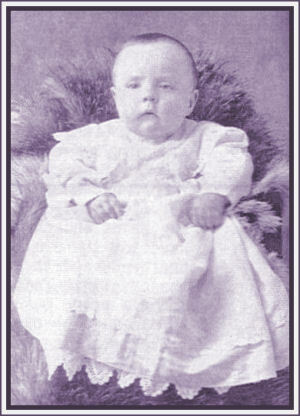 She named her new son John after her husband, and Adolph after her father. With the birth of her son, Anna closed the married years of her life. By the beginning of 1937 she had made the most difficult adjustments to widowhood. She began a new focus: young widow, young mother, professional educator, head of household, and permanent breadwinner. She, her infant son, and her mother moved to Madison, Wisconsin, where Anna began work on her Ph.D. at the University of Wisconsin. When that was finished, she was hired to teach at BYU beginning in the fall of 1939. 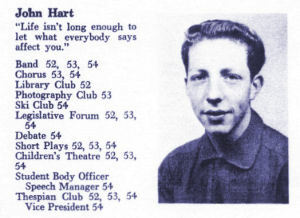 But ever the student, Dr. Hart attended summer school at Columbia University in 1941 and earned a second master's degree at George Peabody College for Teachers in Nashville, Tennessee in 1948-1949. She attended the University of London and the University of Madrid for a few weeks each in 1959 and in 1966, during sabbaticals. She completed ten hours of graduate work at the University of Utah. In addition, she attended numerous workshops, classes and summer institutes at BYU and elsewhere, every year including after she retired. She was a faithful and doting mother to her son, John, who graduated from BY High in 1954. 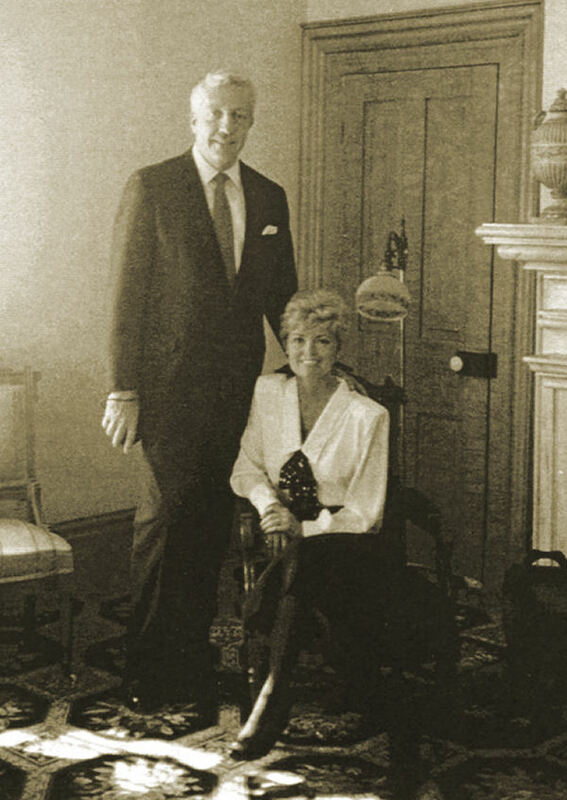 John remarried Shauna Dalton in 1986. They have five children: Elizabeth Hart Bretschneider, John W. Hart, Kenneth R. Hart, Rachelle Hart, and A'Lissa Olson (Shauna's daughter), and a growing number of grandchildren. 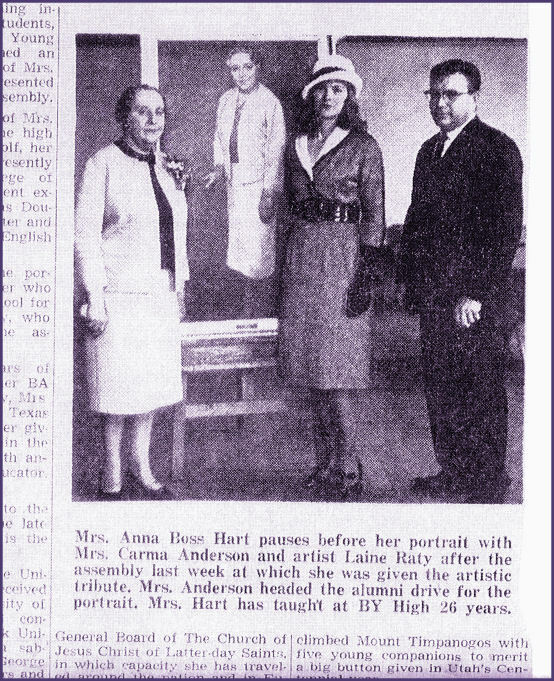 Anna Boss Hart taught at Brigham Young University High School more or less continuously from 1939 to 1968, when BYH was closed. She taught English, speech, religion, and any other classes when she was called on from time to time. She was appreciated and honored by all of her students, but was particularly sought after and loved by her female students, who found a kindred heart in times of trial. She was honored by all of her students, alumni and the BYH faculty in 1965, when a large oil portrait of her was hung in the main hall of BY High, the only portrait to be displayed there. When poet Christie Lund Coles saw the portrait at BY High, she wrote a poem about it. Born Swiss on both sides of her family, she enjoyed serving a mission in the Swiss Temple for two years near the end of her life. Dr. Anna Elizabeth Boss Hart died at the age of 77 at her home, 293 East 600 North, in Provo, on January 4, 1980. She spent the final years of her life researching and writing for BYU, and organizing her extraordinary scrapbooks, gathered over a lifetime.